Many people are apprehensive about visiting their dentist out of fear of painful, uncomfortable procedures, long wait times, and healing periods that seem to take an eternity, but with new technologies in dental surgery, these fears are rapidly becoming feelings of the past. At Rockefeller Cosmetic Dentistry, we pride ourselves on staying one step ahead of the curve, which is why we’ve revolutionized the way we perform gum surgery. Our state-of-the-art dental lasers are safe, highly effective tools than can be used in many dental procedures in the place of traditional methods, providing faster, minimally invasive procedures that take less time to recover from! 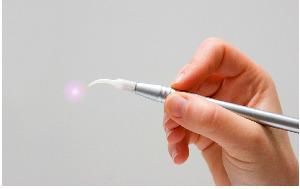 Our dental lasers are used to remove or shape gum tissue, and have several advantages over traditional treatment. What’s more, they are helping to remove the stigma around routine dental procedures that have traditionally been known to be deeply uncomfortable, meaning more patients are flocking to our doors and taking better care of their dental health as a result! Laser equipment has taken on the role of many traditional dental tools, expediting and easing the process of restoring your teeth and smile to their natural beauty. 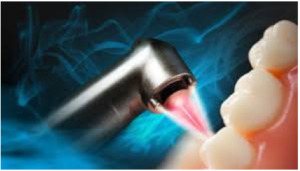 The uses of lasers in cosmetic dental procedures range from tissue shaping during crown lengthening procedures to reattaching gum tissue in the LANAP procedure to complete laser gum therapy. 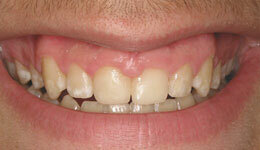 Gum disease is not uncommon. In fact, millions of Americans live with some degree of gum disease every day. The early stages often do not produce severe symptoms, but merely present as irritations (like sensitive gums or gums that bleed during brushing and flossing). While these symptoms may not seem like they require urgent treatment, if you are experiencing any form of irritation or gum pain, it is important to have your gums evaluated by a periodontist in order to stop gum disease in its tracks. 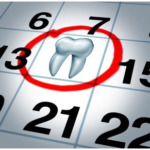 The earlier gum disease is caught, the better. When gum disease is left alone, it can advance into more severe symptoms, and potentially affect your health. In fact, studies have linked gum disease to many serious health complications like heart disease, diabetes, and low birth weight. Many people with gum disease avoid the dentist because of fear of painful or uncomfortable experiences. These fears are not unfounded – traditionally, gum disease treatments involved cutting the gums to remove the diseased tissue. These treatments are invasive and often painful. 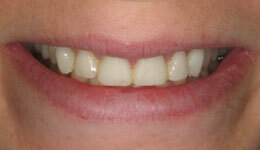 However, advances in modern technology have revolutionized gum disease treatment using dental lasers. 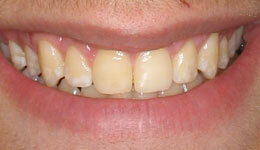 Laser treatment for gum disease is beneficial over traditional gum surgery in every way. Laser gum treatment is minimally invasive and does not involve any cutting or sewing and lasers are capable of extreme precision. LANAP® (Laser Assisted New Attachment Procedure) using the PerioLase® MVP-7™ dental laser is one of these laser dental treatments. 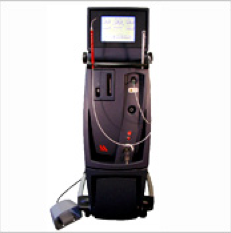 What does LANAP® Laser Treatment Do? 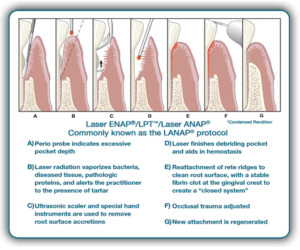 LANAP® laser treatment kills the disease-causing bacteria surrounding the teeth while removing diseased gum tissue and reattaching the healthy tissue to the root of the tooth, which seals off pockets and gaps at the gumline where bacteria can hide. LANAP® is the least invasive and most precise way to treat gum disease, and boasts fast healing time, the ability to save teeth that otherwise might be lost to gum disease, and a much higher rate of restoring and ensuring long-term gum health. 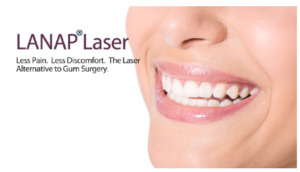 Minimally Invasive – Unlike traditional gum surgery, LANAP® does not involve incisions or sutures. No Pain – Laser gum treatment removes diseased gum tissue painlessly, and helps the body to heal itself naturally. Not only is the treatment comfortable, but post-treatment discomfort is minimal also. Fast Healing – LANAP® assists the gums in reattaching to the teeth – the first stage in healing. Most LANAP® patients can return to their daily routines right away. 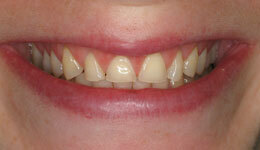 Saves Teeth – LANAP® often allows patients to keep teeth that would not be able to be saved by traditional gum surgery. Tissue regeneration – LANAP® is the only gum disease treatment that has been scientifically proven through clinical trials to not only remove diseased tissue, but stimulate and assist the body to regenerate both bone and gum tissue. 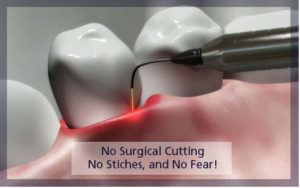 Safety – Laser gum surgery does not involve the risks associated with any kind of incisions, and does not interfere with any other conditions or medications. Regeneration of Bone – LANAP® is the only protocol that is scientifically proven to regenerate bone tissue around teeth. Don’t hesitate to treat your sore, diseased, or bleeding gums, before the condition progresses to something worse. Call our offices at Rockefeller Cosmetic Dentistry at (212) 581-1091 or visit our free consultation request page to book your appointment today. Our expert staff is ready to get you into the chair and back to enjoying your life with a healthy set of gums. 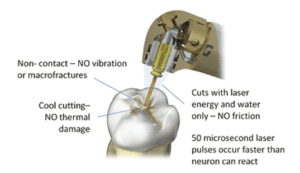 WaterLase© is a combination of water/air spray and leading-edge laser wavelength technology that can cut and shape gum tissue without generating any vibrations, pressure, or heat – all of which are unavoidable with a drill. Waterlase also allows for extreme accuracy – more precision in laser gum therapy than ever before. What’s more, the laser pulses of Waterlase© are too fast for your neurons to properly respond, and no vibrations and heat mean no pain or discomfort, making WaterLase© the ideal treatment for patients who experience nervousness or anxiety about dental procedures or fear of dental drills. WaterLase© can be used in root canal therapy, preparation of cavities for fillings and restorations, removal of decay prior to fillings, and an array of procedures involving cosmetic dental design. PerioLase is a dental laser that was specifically designed for LANAP® laser gum therapy with specialized features incorporated into its design to treat soft gum tissue. PerioLase is the most widely used dental laser and the first to incorporate digital technologies into laser gum treatment, revolutionizing the entire process. 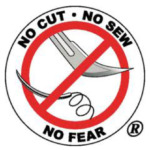 With PerioLase treatment, there is no cutting or stitches involved. This makes for faster healing time and a minimization of post-treatment bleeding and swelling. If you have gingivitis or gum disease that needs treatment beyond scaling and root planing, PerioLase therapy can be an extremely effective and far less invasive option than traditional gum surgery. Request your laser therapy today! If you’ve put off your routine 6-month dental check up or getting that surgery to complete your perfect smile out of fear of pain and discomfort in the dentist’s chair, hesitate no more! With advancements in laser dentistry, you can finally rest assured that we can restore your teeth and gums with as little pain and as much accuracy as possible. Visit our appointment request page or call Rockefeller Cosmetic Dentistry at (212) 581-1091 to request your consultation with one of our Ivy League trained Manhattan dentists. Relax and let us get you back to smiling!